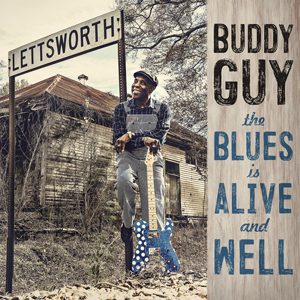 [New York, NY – June 25, 2018] Today, Multi-Grammy Award winning blues icon Buddy Guy celebrates that his 18th studio album, THE BLUES IS ALIVE AND WELL debuts at #1 on Billboard’s Top Blues Album chart and marks his sixth #1 album on the chart and thirteenth Top 10 Billboard Blues album. Released via Silvertone/RCA Records, THE BLUES IS ALIVE AND WELL has been heralded as one of the best albums of his career. Grammy Award winning producer/songwriter and longtime collaborator Tom Hambridge produced the album and penned 13 original songs for the album. It was previously announced that Buddy Guy will be the recipient of the The Americana Music Association Lifetime Achievement Award on September 12th ceremony at Nashville’s Ryman Auditorium. Visit http://americanamusic.org/ for more information. In his quest to keep the genre vital, Guy chats about the origin of southern blues and performs on David Letterman’s series, My Next Guest Needs No Introduction, airing now on Netflix. At 81 years young, Guy proves that it gets greater later as he continues to record and tour around the world with performances at the New Orleans Jazz & Heritage Festival, Austin City Limits Live at the Moody Theater and more (click here and see below for his current tour schedule).